We occasionally publish letters from death row inmates. Today we hear from James Broadnax, who was sentenced to death after being convicted for a 2008 robbery and murder in Texas. Broadnax, who is now 27 years old, has been on death row for seven years. He was convicted of shooting and killing a man named Stephen Swan and robbing him of a small sum of money as he left a recording studio. The studio’s owner, Matthew Butler, was also shot and killed. Though he does not have an execution date pending, Broadnax wrote us and answered the standard set of questions we ask of death row inmates. He begins with thoughts on his own case. He writes about how he has changed during his time on death row. He speaks on the media and shares his final thoughts. 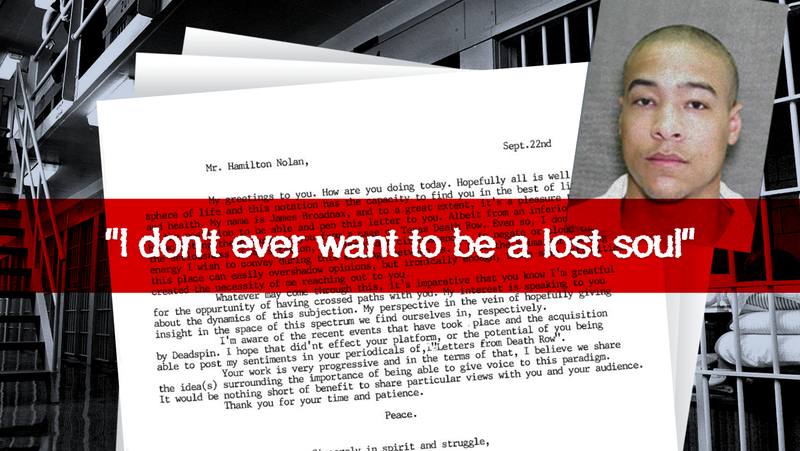 Gawker’s “Letters from Death Row” series can be found here.